AERO COLOR Professional stands for ideal working properties. 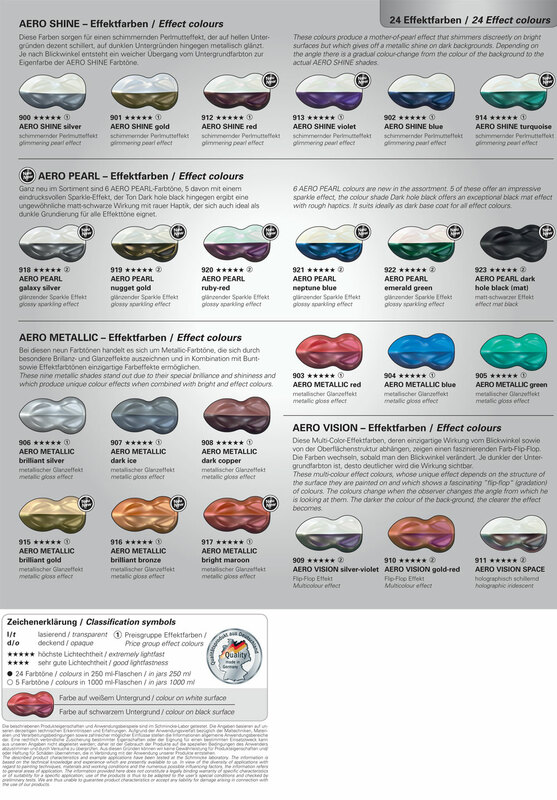 AERO COLOR Professional colours have a pleasant odour, are easy to use and can be used on most grease-free surfaces. All colours are ready for use. Due to their finest pigmentation, they can be used pure but can also be diluted with AERO MEDIUM (Art.No. 50 602) or with water. Many of the 36 colours as well as the 24 new effect colours are single-pigment shades that guarantee brilliant mixtures and an unlimited variety of shades. A large number of the bright colours are transparent or semi-transparent. They can be made opaque by adding a minute quantity of extremely opaque AERO COLOR Professional colour SUPRA-white, opaque (28 101) without losing their brightness.